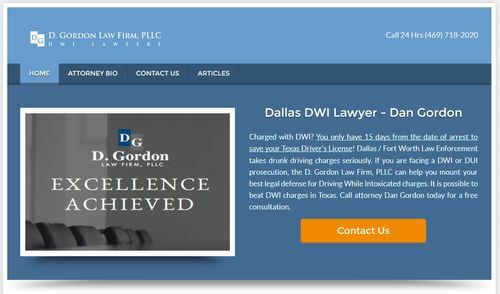 The Dallas DWI Lawyer helps clients in the greater Dallas / Fort Worth Texas areas who have been arrested for driving while intoxicated (DWI) or driving under the influence (DUI). If you have been charged with DWI, then you only have 15 days from the date of arrest to save your Texas Driver’s License. Therefore, you should call our office to speak to an attorney as soon as possible. We offer free DWI case evaluations to every new client. Our attorneys believe that nobody should ever have to face the Texas Criminal Justice System alone. An experienced DWI focused law firm may be able to help you employ your best criminal defense strategy. Many times it is possible to achieve a favorable outcome in a Texas Driving while intoxicated criminal defense. The criminal courts in the Dallas and Fort Worth areas hold many DWI cases every year. This is a charge that the State of Texas takes very seriously. You should never face the criminal justice system alone. If you are pulled over for a DWI in Texas, always below polite to the officer, assert your constitutionally guaranteed rights, and call your attorney as soon as practical (469) 718-2020. Generally speaking, a first offense DWI conviction is a Class B misdemeanor, carrying a Maximum $2,000 fine and 72 hours – 180 days jail time. Let’s take a quick look at the applicable statute defining the DWI punishment ranges. (shown in italics below).